Layer comps are a convenient way to store a snapshot of multiple variations of your document. Learn how to use this powerful tool to your advantage. Here are all three of my versions merged into one document side-by-side. The joys of working with layer comps aren't limited to just working inside Photoshop. 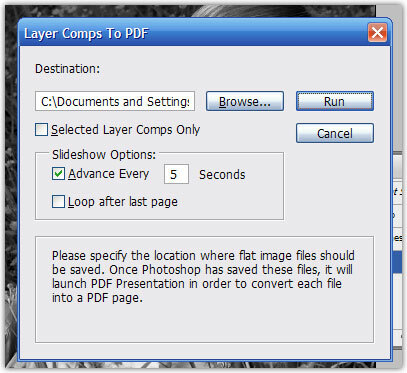 Photoshop also provides the ability to export the layer comps as individual pages in a PDF document or into separate files. With this feature you can quickly turn a set of layer comps into individual files or a PDF presentation that you can send to a client for review and approval. To use this feature, go to File > Scripts > Layer Comps to Files. A window will appear with fairly self-explainatory options. You will need to select the destination location, the prefix for the file names (it will create one file for each composition), and the file type/format. If you don't want to export all layer comps, make sure that you have selected the only comps that you want in the Layer Comps palette and check the Selected Layer Comps only box. After choosing all options, click the Run button. This is a really cool feature in my mind. To use this feature, go to File > Scripts > Layer Comps to PDF. Again, a window will appear with fairly self-explainatory options. First browse to select the destination location. Next, if you don't want to export all layer comps, make sure that you have selected the only comps that you want in the Layer Comps palette and check the Selected Layer Comps only box. The Slideshow Options let you control how the PDF will be presented. The Advance Every x Seconds option lets you create a self-running presentation that automatically advances through the pages. Of course, if you don't want to advance the pages automatically, you can use the keyboard to move forward and backward in the presentation. The Loop After Last Page option turns the presentation into a never-ending show. In most situations this is not recommended or needed, so it is left unchecked by default. Finally, click the Run button to create the PDF. Photoshop automatically takes each of the layer comps and turns it into a separate, flattened image. Then, the flattened images are assembled together into a PDF. The PDF is set to open automatically in the full screen mode. There you have it! I hope you find layer comps as valuable as I have. View our entire collection of photoshop tutorials.